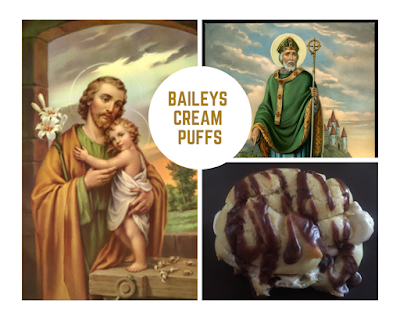 The feasts of St. Patrick and St. Joseph share a week in mid-March. Since they are just days apart how about a treat that combines elements of cultural symbolism of each. The cream puff - an Italian pastry sfingi, is a typical St. Joseph treat. 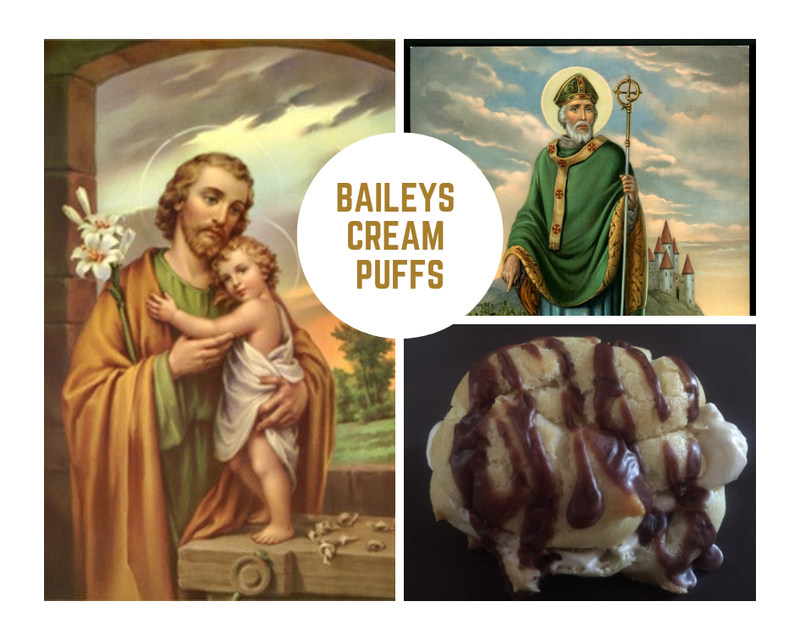 But this variation on the traditional cream puff gets an extra kick from the addition of Baileys Irish Cream, a tribute the land of St. Patrick. Combine butter, sugar, and water in medium sauce pan over medium heat. Bring it to boil, while stirring slowly, and take off heat. Add flour and stir until all combined and coming off the walls of the pan easily. Whisk in eggs, one at a time, making sure that each egg is mixed into the batter before adding another. Transfer batter into a piping bag and pipe little round mounts, about 1 ½ inches in diameter. For egg wash, beat 1 egg in a separate little mixing bowl and brush pastries with egg wash before baking. Bake pastries at 425 for 12-15 minutes then lower the heat to 350 and bake for another 10 minutes, until golden brown. Let pastries cool completely before adding the filling. Add the cold heavy whipping cream into the cold mixing bowl. Starting at low speed, start whisking, gradually raise to speed to high. Slowly pour in the sugar and then Baileys. Beat until stiff peaks appear (don't walk away far). Keep in the refrigerator until ready to use. Transfer whipped cream into a piping bag. Cut cooled pastries in the middle and fill them with whipped cream. Heat up hot fudge topping and whisk it with Bailey's until completely combined. Cool before using so it doesn't melt the whipped cream. Once cooled, drizzle filled cream puffs with chocolate sauce.